The Abominables at Children’s Theatre Company is a delightful surprise. I honestly wasn’t sure what to expect, since normally if you said to me: theater for young audiences, musical, and hockey; I’d probably reply “I don’t think I’m the audience for this one.” In this case, I’m very happy to be proven wrong. CTC’s collaboration with fellow theater company The Civilians has paid off in a smart, funny script with clever songs and a great cast. 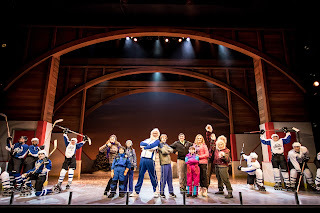 And yes, it’s a musical about hockey geared toward young audiences, and nevertheless I thoroughly enjoyed myself. Because it’s not just kids who will recognize themselves up on the CTC stage, their parents will, too. The Abominables centers around two competing Minnesota youth hockey families. Young Mitch (Henry Constable) has been working hard all summer to be ready for tryouts so he can get himself a spot on the A Team with his more athletically gifted friends Zach (Zachary Hodgkins) and Ryan (Carter Bannwarth). Mitch getting on the A Team means his parents Ellen and Charlie (Autumn Ness and Reed Sigmund) also get the benefits of hanging out with the other A Team parents. Meanwhile, Mitch’s two sisters get little to no attention, even though Tracy (Natalie Tran) is the star of the girl’s hockey team. Youngest sister Lily (Valerie Wick) has zero interest in sports, so she’s practically invisible. Everything is poised to go Mitch’s way, but then a new family comes to town. Judy and Hank (Elise Benson and Bradley Greenwald) are famous mountain climbers who have decided to live for a while with the little people in the decidedly un-mountainous state of Minnesota for the good of their eldest adopted son Harry (Ryan Colbert). Harry’s not your average kid. He’s a yeti (aka abominable snowman). And he’s so good at hockey, that poor Mitch doesn’t stand a chance. Mitch and his family are relegated to the B Team, and they don’t take it well. Mitch’s sister Lily, however, makes a new friend in kindred spirit Freddy (Alejandro Vega), Harry’s human little brother, who also has zero interest in sports. Writer/director Steve Cosson, and composer of music and lyrics Michael Friedman, do an extremely impressive job of juggling all these characters (and then some) along with all their interwoven plots and subplots into a story that’s fast-moving and yet easy to follow. Even when the characters are doing stupid, selfish, or questionable things, they remain compelling to watch - even if you’re not entirely sure you like them all the time. Maybe it’s the singing. Maybe it’s the fact that there’s a yeti right in the middle of all of it. Mitch’s selfishness, and his mother Ellen’s competitive streak, makes them both occasionally unlikable characters. Mitch says and does particularly hateful things because, well, he’s a teenage boy who’s wrapped up his sense of self-worth a bit too much in a sport that - everyone needs to be honest - he’s not going to make a living in the pros playing. The yeti in the midst of this allows the play to do some fairly savvy takes on racism without ever fully calling it out. That’s kind of the genius of the play - it doesn’t bang anybody over the head with messages and morals, and yet they’re unmistakable and hard to miss. It addresses subjects around parenting, sexism, and adoption, as well as racism, all in the context of the larger story. The artists trust the audience to think for themselves - and continue thinking after they leave the theater. Because unlike the vast majority of sports-related entertainment, this one isn’t dependent on our heroes winning the big game to be satisfying. The whole notions of winning and losing and what it means to be part of a team are poked and prodded from several different angles, but again, not in a heavy-handed way, all of which I found really refreshing. The Abominables is also an impressive logistical feat. 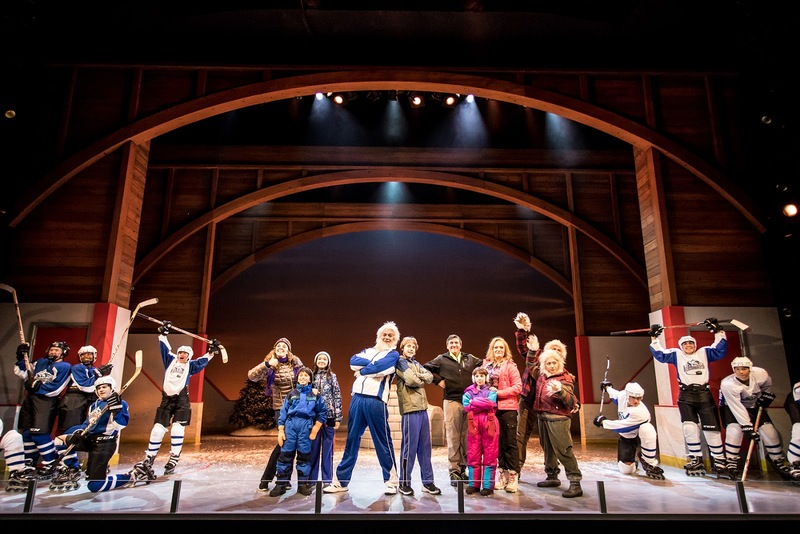 The “rink” on which our hockey players spend a lot of time rollerblading is central to Andrew Boyce’s set design - in the same way it’s central to the characters’ lives and the story as a whole. But other home and hotel set pieces fly and roll in and out at various points in the story (we even get an igloo at one point). The sleek yet unobtrusive work of Jake DeGroot’s lighting design and Sten Severson’s sound design make the look and noise of this world seem a lot less complex than it probably is. Several actors spend time in the air. The number of things that could and yet do not go screwy on this production are legion so for degree of difficulty alone stage manager Stacy McIntosh, her assistants Nate Stanger and Sonja Thorson, and interns Eva Chastain, and Coletrane T. Johnson all deserve a big shout-out for keeping the thing running so smoothly. The fact that I’m not pondering things like ALL those clothes means that costume designer Jessica Pabst’s work has just the ring of truth the story needs (in addition to everyone listed above, they need to outfit Stephanie Bertumen and Doug Neithercott who both take on multiple roles to great comedic effect, plus there’s an ensemble of young hockey players backing up the main characters - Logan Baker, Sage Brahmstedt, Hunter Conrad, Meredith “Mimi” Kol-Balfour, Evan Latta, Peder Lindell [also the hockey captain - the show has a fight captain and a dance captain as well], and Richard Norman.) Joe Chvala’s dance choreography and Ryan Bourque’s fight and hockey choreography keep all those bodies moving effortlessly around each other in space, taking your mind off the fact that it’s a minor miracle that all these people aren’t constantly crashing into one another. And of course, it ain’t a musical without the band (who, down in the pit, where a huge hit with the kids pre and post show as well as at intermission) - music director, conductor and keyboardist Andrew Fleser leads David Singley on guitar, Greg Angel on bass, and Steve Kimball on percussion. The only bad thing about The Abominables is a loss behind the scenes. Composer Michael Friedman died less than a week before The Abominables had its world-premiere opening night at CTC. Friedman was only 41 years old. He accomplished a lot as a regular collaborator with The Civilians, and elsewhere, garnering himself an Obie Award for his significant output. Given the work on display in The Abominables, who knows what other songs he might have written with more time. We’re grateful we got this one but damn, that’s a shame.